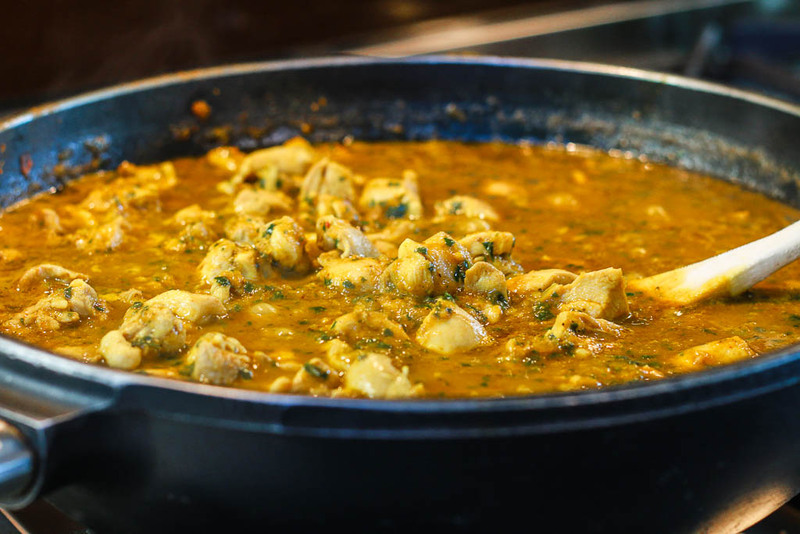 Fresh ingredients, indian spices - a healthy spicy chicken curry made with spinach. So delicious! Before you start making this curry you will need to make up a ginger and garlic paste. This paste keeps in the fridge for about two weeks to use in other curries. Using a small blender take equal quanties of ginger and garlic: a whole bulb of garlic and whole root of ginger. Peel all the cloves of garlic and remove all the skin from the ginger, place them in the blender with a little water and blend until you have a paste. Add the water a little at a time as you don't want a soup, but it all needs to be nicely blended and smooth. This is the most labour intensive part of this dish but is so important for the flavour. I like to make a lot of this paste as it does take a while to peel all the garlic cloves and ginger, you don't want to be doing it every time you make a curry. I store it in a glass tupperware in the fridge. Dry fry all the spices in a pan until they are smoking and fragrant. Remove these from the pan and set aside. Melt two tablespoons of the coconut oil in the same pan and fry the onions until they are glassy, add the garlic and ginger paste and fry for a minute. Garlic burns very quickly so be careful. Add the tomatoes, the chicken stock and the water (the optional chilli), as well as the curry spices and allow this to bubble for about 5 minutes. This is your sauce. Pour this lovely sauce into a blender together with the baby spinach and blend till smooth. The heat from the sauce will cook the spinach. Use the same frying pan and add the remainder of the coconut oil and fry the chicken until it is almost cooked. Add the sauce and allow the whole lot to simmer for about 20 minutes. Now comes the hardest part: balancing a curry. This is something very few people do when making a curry. This is only done at the end of the cooking process. 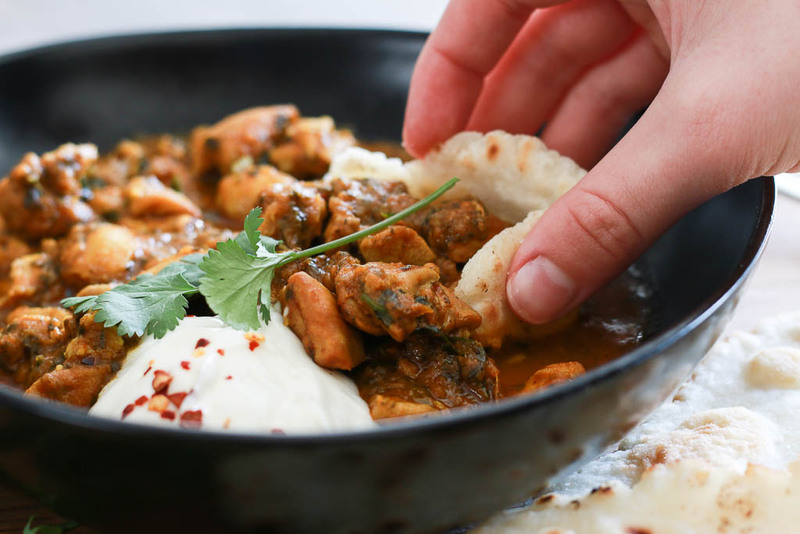 A curry needs to have a little bit of sweet, salty, and sour. I have put quantities in the ingredients but these are estimates as it really boils down to the individual. Start by adding the lemon juice and a little of the agave or sugar. Add a little of the salt. Taste, taste, taste! The favours should balance. Adding sugar generally brings out the heat in a curry. Sometimes this takes practice. The curry should have a little sour, a little sweet and a little salty with the spice as well. So keep adding the favouring until you feel it is perfect. Add the coriander once you feel the flavours are perfectly balanced. Save a little coriander for garnish. If your curry has too much liquid simply allow it to simmer a little longer. Another trick to thickening a curry is too add a tablespoon or two of almond flour, this will soak up the extra liquid and not change the flavour. The use of chicken thighs is important as they don't dry out and can take longer cooking time. Serve this with basmati rice, a nice dollop of yogurt and indian roti.